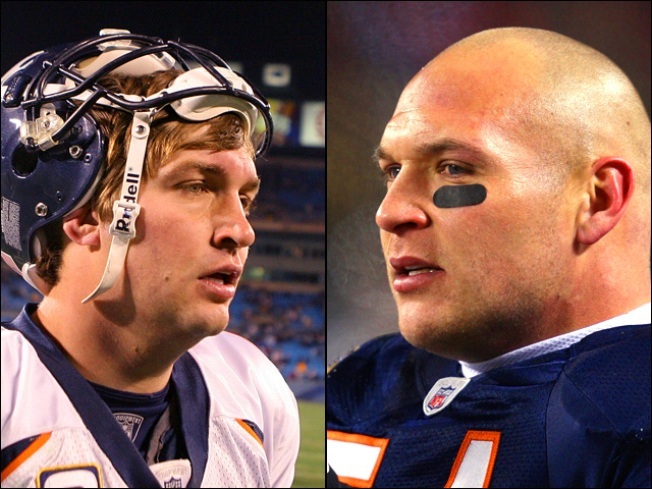 Brian Urlacher had some choice words for Cutler. Brian Urlacher has been viewing much of the disastrous 2009 Bears season in the most frustrating position possible: his sofa. Urlacher's injured wrist has kept him from contributing to Lovie Smith and company's sudden downfall this season -- not that he would have been able to change the outcome much -- but he's been watching the season closely. What does he see? A Bears team with a new identity, an identity he blames on new quarterback Jay Cutler. Urlacher is frustrated -- isn't everyone? -- so this notion is understandable. It's also dead wrong. The Bears are not bad because they've lost their identity or because the team is suddenly more oriented toward the pass. The Bears are bad because they can't run the ball at all. It's simple cause and effect. If the Bears' offensive line wasn't so inept, the Bears would be able to mix up their play-calling with more runs to a presumably more effective Matt Forte. Because the Bears haven't done that well all year -- Forte's only productive games have come against the Lions and the Browns -- the pass is the only other option. And when you pay a quarterback $50 million, you have to be willing to rely on him. The defense shares plenty of the blame. Is it Jay Cutler's fault the Bears defensive line can't stop anyone? Is it Cutler's fault the secondary is vulnerable? It's not. But it's Cutler's responsibility to try and make enough plays through the air to keep the Bears in games when the defense can't. That's not identity. That's just bad football. Urlacher's opinion could be taken with a grain of salt if it wasn't so widespread among Bears fans. But trust us: Kyle Orton might be a "winner," but he's a winner thanks to his teammates. If Cutler's a loser, the same rule applies. The Bears' seven losses are no more Jay Cutler's fault than their nine wins in 2008 were Kyle Orton's. The sooner we nip this meme in the bud, the sooner the Bears can get around to focusing on what really matters: firing everyone and everything associated with this front office and drafting some freaking talent for once. Sound like a plan?